The first time I cooked lobster, I couldn’t eat it. At the time I thought it was the act of killing them that put me off. But now I think the fact that I foolishly held a lobster race on the kitchen floor to entertain my then two-year-old while the water heated was likely the real source of my unease. Nowadays, my kitchen is regularly the final stop for lobsters. But they are treated with respect – I keep them in the bag until the last minute; we don’t play with them. There is still nothing elegant about the process, but it is done with dignity. 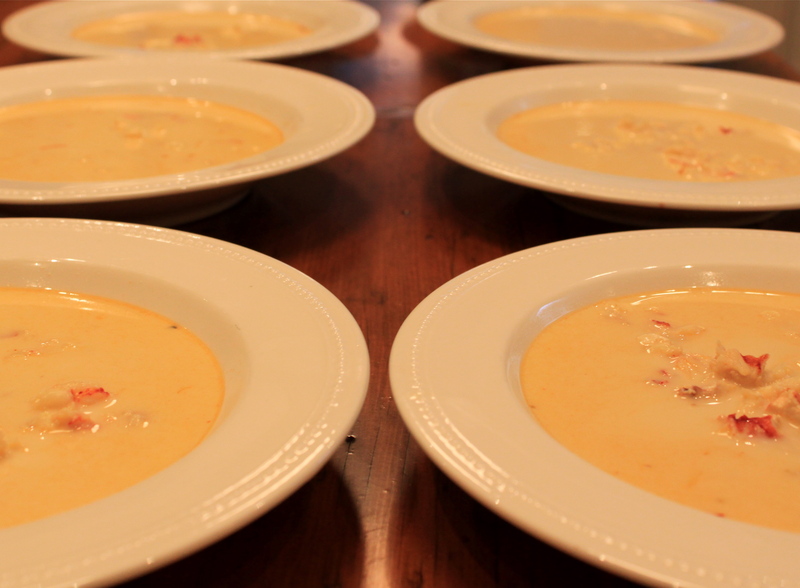 Here’s a bisque I made for a crowd last week. It was loosely adapted from a recipe in the New York Times. Fill a stock pot with water and salt heavily. When the water is boiling add the lobsters – you can look away if you like. Boil gently for 10 minutes (you don’t want to over cook the lobster – the meat becomes rubbery). Remove the lobster meat and set aside. Keep the shells and other lobster bits for the stock. Sauté the vegetables and herbs in a pan for five minutes and then add the lobster shells and carcass. Sauté for another few minutes. Add the wine and clam juice and some of the lobster-cooking water (2-3 cups). Reduce heat, cover and simmer for an hour or so. Strain the broth through a colander and return to the pot. add the cream, the lobster meat and a pinch of saffron (mixed with a little hot water), salt to taste and a pinch of cayenne. This entry was posted in Fish and Seafood, Soups and Stews. Bookmark the permalink.